As for those who complain about 1v1s an this (or any other) map, I'd recommend trying some games with more people... I've found the 6-player games I've played on it far more enjoyable, even if equally as tense as the actual World Cup at times! Ahh but just so happens the tournament was a 1 vs 1... I did not win a single game. In fact I opened 3 of 4 games and had 0 chance from round 1 when I went 2nd. Yeah sure dice happen, but the setup is made to favor first player. Maybe I will try a 6 player on it. Thanks for the effort. The Entertainment Team and DJ Teflon are proud to present the Official CC World Speed Cup 2010! The tournament will be played on the Limited Edition: World Cup Map! which is available for play until July 11th! To help our freemium members celebrate and partake in the special speed tournament, there will be 48 hours of Free Unlimited Speed Games ONLY on the Limited Edition: World Cup Map! The Free Speed Games will begin at 12:01am CST on Saturday the 10th of July and will come to a close at 12:01am CST on Monday the 12th of July! This speed tournament will take place on Saturday 10th July 2010. The first round will kick-off at 6.30pm BST (London time/GMT +1). This is 1.30PM EST, 12.30PM CST. Please check your time zone with this link - World Clock. Registered players must be ready to join at 6.10pm BST (London time/GMT +1). Only players who have not already joined one of the current Official World Cup Celebration Tournaments can pre-register (others may be able to join on the day however). Players must remain logged-on to CC until they are out of the tournament, or until they win. You need to make sure that you have enough time to dedicate to this tournament, before signing up (The tournament will be running for several hours). Freemium members can participate in this tournament. Thanks to the Discussions Team we have some great premium prizes up for grabs! See the tournament thread for more information, make sure you know the rules and minor details before signing up! Wow, One Set of free speed games. maybe. 2? This is the reason why I love conquerclub! I must respond again. After playing the map some more times, I must retract this statement. The map is surely a different style, but plays nicely when more than 2 players are on it. Well done! Quarter- and Semi-finalists are far undervalued for 5 and 7 neutrals, respectively. thank you, thank you, thank you. I am so glad to see all this soccer crap finally getting over with. So if you're not participating in the tournament you can still play free speed games? and an unlimited number of them? if you still need tourney players count me in. The Speed Game Holiday has been extended for 24 hrs due to the mix-up with the speed tournament the other day! The World Cup Map will be closed at some point in the next 24 hrs! So make any games you want to make now, before it goes away forever! 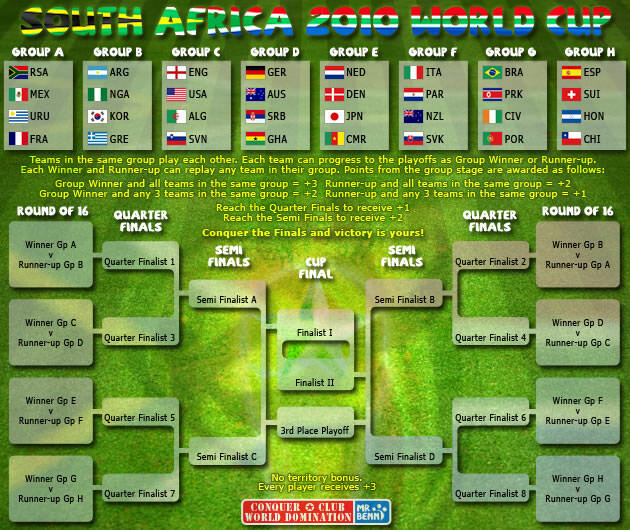 samuelc812 wrote: The World Cup Map will be closed at some point in the next 24 hrs! So make any games you want to make now, before it goes away forever! how will the remaining official tournament finish without the map? Closing a map only prevents the creation of new games. It should not affect games already underway. But if we haven't got the final games of the tournaments started, then there may be a problem, unless the tournament organizers have some special privileges for starting games. The Map will still be used for the tournaments, but will not be up for public play.